Whether you’re south side or central, coming in from Sherwood Park or Spruce Grove, Edmonton’s newest marquee building is visible from afar, twice as tall as its nearest downtown neighbours, reaching higher than any Canadian structure outside of Toronto. And it’s not even completed yet. Stantec’s 66-storey cloud piercer was meant to make a statement — both that Stantec is an international, New York Stock Exchange-traded company, and that Edmonton, where Stantec started, is well-suited to house its headquarters. But like the district it borders, the Stantec Tower is not just a business and civic crown jewel. It’s a tower intended to meld the public and private, and help transform the downtown core into the spot, for people in and around the city, to convene in celebration, any time of year. Shugarman understands the desire to think of the tower as one single thing, but clarifies that it’s really three: A podium, beneath a tower, which itself is divided in two, like a well-crafted stone monument built up from the garden below. “The tower is a little tougher and stronger and bolder in the sense that it’s this rectangular, very efficient tower. In this case it is true to say that form follows function to a great extent,” he says. 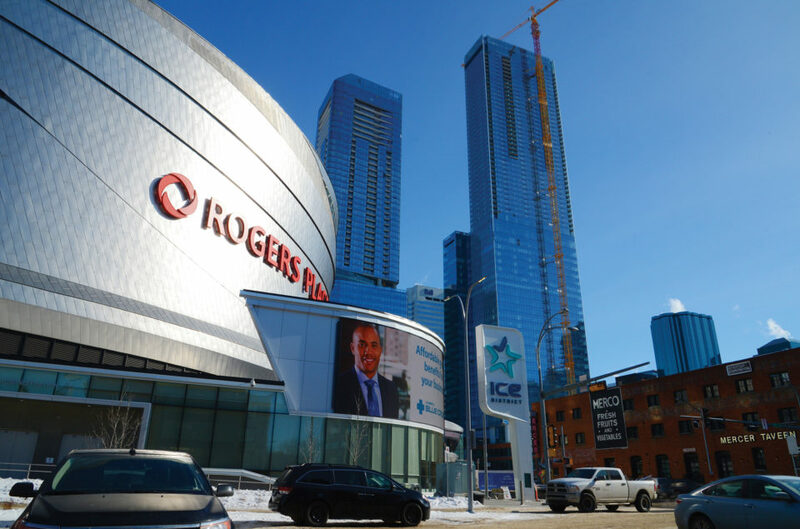 Of course, there’d be no tower if not for the hockey team, and while the architects were never going to slap a giant oil drop on each tower face, it would be weird to not reference the Oilers in some subtle way. The tower’s windows are deep blue (the less expensive default is green), the building’s base has orange terra cotta tiles and the soffits and canopies are white. It could be tough to take it all in up close, but no one will miss the dual vertical fins with programmable lights running up the tower’s north and south sides, culminating in two giant screens that will generate images and scenes for generations to come. Ideally, said scenes will involve a certain silver cup, but there will be plenty of Pride, Canada Day and other celebrations to capture until then. Before final site selection, Shugarman was tasked with traveling to a few other arena district developers around the continent, to study and see what went right or wrong. Get it done fast, they said, and make a memorable statement. But the biggest lesson was about the stuff that wasn’t there. You aren’t creating objects, they told him, you’re creating spaces — real, evolving parts of cities. “It’s very different than constructing a single building,” he says. “The spaces in between and around are really the end game. It just so happens the tower is the strongest surrounding piece.